When Colbie takes a much-needed break, she doesn’t expect to meet the man of her dreams or find unexpected balance, but when she does, will it mean completely leaving her old life behind to embrace her newfound happiness? When a late-season hurricane thwarts her plan to head to a tropical island for a pre-holiday vacation, bestselling author Colbie Albright spontaneously buys a ticket to San Francisco instead. She has three weeks before she needs to head back to New York for Christmas with her mother and twin brothers—“twenty-three going on twelve”—all of whom she's allowed to become completely dependent on her. She supports them financially and emotionally, which leaves her burned out and exhausted. On her way to her hotel, she stops in the Cow Hollow district to check out the famous fountain “with the crazy love legend that had appealed to the writer deep down inside her”—and a giant dog knocks her into the water. The dog walker, Spence Baldwin, feels guilty enough and is immediately attracted to her enough that he offers Colbie the use of an apartment he owns. Spence and Colbie each have secrets, but as they move into an affair, chip away at their insecurities, and win over Spence’s skeptical friends—making them both more productive on their individual projects and balanced overall—they begin to wonder what exactly is keeping them apart. However, neither one is willing to take the first step beyond their strictly enforced affair-only zone until Colbie actually gets on a plane home to New York and realizes she may have ruined everything. 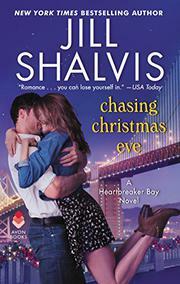 Shalvis achieves another winning love story with her signature mix of witty banter, lighthearted humor, and romantic high notes.